Using student mathematical thinking during instruction is valued by the mathematics education community, yet practices surrounding such use remain difficult for teachers to enact well, particularly in the moment during whole-class instruction. Teachers’ orientations—their beliefs, values, and preferences—influence their actions, so one important aspect of understanding teachers’ use of student thinking as a resource is understanding their related orientations. 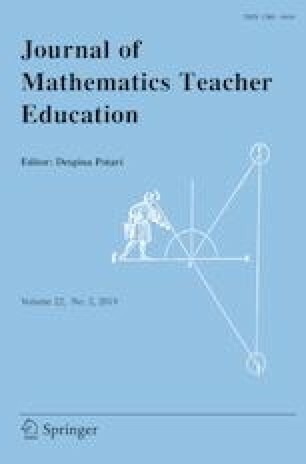 To that end, the purpose of this study is to characterize teachers’ orientations toward using student mathematical thinking as a resource during whole-class instruction. We analyzed a collection of 173 thinking-as-a-resource orientations inferred from scenario-based interviews conducted with 13 teachers. The potential of each orientation to support the development of the practice of productively using student mathematical thinking was classified by considering each orientation’s relationship to three frameworks related to recognizing and leveraging high-potential instances of student mathematical thinking. After discussing orientations with different levels of potential, we consider the cases of two teachers to illustrate how a particular collection of thinking-as-a-resource orientations could support or hinder a teacher’s development of the practice of building on student thinking. The work contributes to the field’s understanding of why particular orientations might have more or less potential to support teachers’ development of particular teaching practices. It could also be used as a model for analyzing different collections of orientations and could support mathematics teacher educators by allowing them to better tailor their work to meet teachers’ specific needs. This work was funded in part by the National Science Foundation (NSF) under Grant Nos. 1220141, 1220357, and 1220148. Any opinions, findings, and conclusions or recommendations expressed in this material are those of the authors and do not necessarily reflect the views of the NSF. The authors would like to thank Elizabeth Fraser and Annick Rougee for their contributions to work that informed this paper. Given two concentric circles, radii 5 cm and 3 cm, what is the area of the band between the circles? The teacher has just posed a problem parallel to the one above with circles of radii 4 cm and 1 cm. Jenny received $25 for her birthday that she deposited into a savings account. She has a babysitting job that pays $10 per week, which she deposits into her account each week. Write an equation that she can use to predict how much she will have saved after any number of weeks. The teacher asked, “How do we find the equation given any table?” and put this generic table of values [to the right] on the board for the students to use in their explanation. It is important to find out what students are thinking/understanding by having the class comment on or ask questions of the student whose thinking has been shared. It is important to monitor student work in order to direct class discussion and consider the flow and progression of student contributions. Hearing the student thinking behind a response may help the class make sense of the mathematical idea underlying the response. It is preferable to direct a question related to a student’s response to the whole class. Monitoring student work and sequencing are an important part of teaching a lesson. Student thinking is valuable and it is preferable that a student’s ideas are tossed out for other students in the class to see and discuss, rather than the teacher being the one to evaluate those ideas. It is important for students to support, critique, listen to, and see other students’ work and to explain their own thinking to others. Students learn by comparing their mathematical work, which in some cases could include an alternative solution or method provided by the teacher. Students can identify mistakes and question the shared work of fellow students without the teacher intervening to ask questions. Digging into a student’s thinking or having a student clarify their thinking can surface more reasoning and is beneficial to the class, so the main purpose/power of using student thinking is to promote learning for all students and to get them engaged. Student thinking should be made public so that students can discuss, correct, and improve their understanding of the student thinking. It is valuable for students to see and hear other students’ mathematical explanations. A teacher’s actions related to student thinking, including their reasoning about selecting, sequencing, pursuing or dismissing student thinking, depends on the teacher’s goals and the task at hand. The teacher should respond to student thinking by explaining, showing, using examples, and demonstrating mathematical ideas to students. Students who claim they used a different method than another student may not have understood the original method that had been shared, so their method may be the same. Student thinking should come from highly scaffolded instruction that minimizes student struggle. If a student’s answer is correct but the mathematics of their statement was incomplete, the student got lucky. For problems where a diagram may support the process of finding a solution, it is always important for students to first have an accurate diagram before working on the problem. Students are unlikely to make sense of a situation involving an idea that has not been addressed in class. Students who provide numbers without reasoning are likely trying to guess and check and would rather do this and wait for the teacher’s validation than reason through the problem. Students stop making sense of a problem once they have the right answer. If students believe that a particular student is smart, they assume the student is right and repeat that student’s thinking rather than share their own. Students should share their ideas one at a time and the teacher should resolve each idea before another idea is shared. It is the teacher’s responsibility to correct student mistakes and misconceptions as quickly as possible. If student thinking reveals a lack of understanding, the teacher should help that student understand by asking them guiding questions or going back to previously taught ideas. It is better to address a student’s thinking one on one rather than in a whole-class setting because students will understand and retain better. It is difficult for a teacher to keep track of students’ thinking all at once, particularly in large classes.